Was the filament used. Any food-safe filament should work for this project. Used to slice the models for 3D printing. A Printrbot Metal Simple was used for all parts of this project. Any printer should work if it has at least 150 mm of build area in all directions. A) Print the parts. Only the Inner Container and the Outer Shells require supports. Clean the parts of supports well. Medium grit sandpaper may be helpful in this regard. B) Thread the Inner Plug into the Cap. Slide the Bearings onto the center pegs on the Outer Shells. NOTE: The Bearings have an extra protrusion on one side in the center roller. 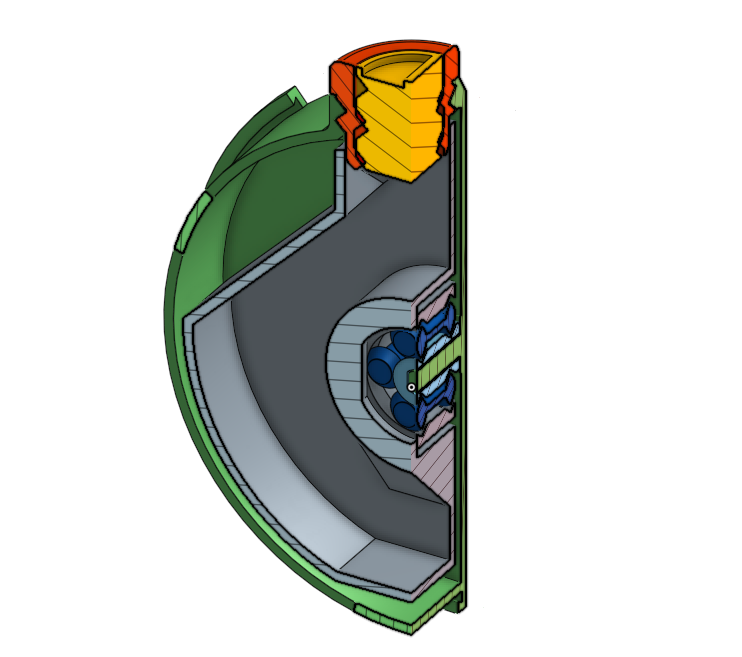 This extra margin should be touching the large face of the Outer Shell, holding the majority of the Bearing away from the face to prevent excess friction. C) Slide the Inner Container onto one of the two Bearings. It should rotate freely, concentric to the Outer Shell. D) Slide the other Bearing and Outer Shell into the Inner Container, mirroring the assembly. Be sure that the tabs slide together, assuring alignment. E) Rubber band the protruding tabs from the Outer Shells together, binding the assembly together. Screw the cap into the top, making sure it slides into the top of the container, and your Canteen of Denial is done! When someone tries to drink from this normally, the inner container will remain vertical, preventing any water from being drunk. In order to drink from the canteen, one must know the secret. The cap, when screwed in fully, extends downwards just enough to prevent the inner container from tilting. The cap, however, is actually tubular. A threaded insert can be removed from the cap, unscrewing clockwise. This will produce a convenient drinking channel, with the inner container held in place by the cap. This is one of the two outer halves of the canteen. It requires only 45 degree angle supports touching the build plate when printed on the large, flat face. This is one of the two outer halves of the canteen. It only requires 45 degree angle supports touching the build plate when printed on the large, flat face. This is the Main Cap. It threads into and between the two Outer Shells. It holds the Inner Container in places when fully threaded, and the Inner Plug threads into this part. This part does not require supports when printed upside down, with the unthreaded portion touching the buildplate and the threaded sections directly above it, following a vertical helix. This is the Inner Plug, which stealthily threads into the Cap. This can be unscrewed from the cap, allowing the user to drink from the canteen through the now tubular Cap, which holds the Inner Container in place. This part does not require supports when the circular bottom is touching the buildplate (the indentations should be the top, the last thing printed). This is the Inner Container, which is the object that actually holds the water. As such, this needs to be printed with a thick shell. A shell thickness of 1.2 or 1.6 works well for preventing leaks. The Bearings and Cap slide into this part fairly easily through the sides and top, respectively. This part should be printed upright, with the flattened edge on the buildplate, with the opening to the internal cavity facing skyward. This is a Bearing, which slides onto the central peg of the Outer Shells and into the side of the Inner Container fairly easily, allowing the Inner Container to turn freely. This part does not require supports, although a raft is helpful to prevent fusing. This part should be oriented such that the small extra protrusion is facing upwards, away from the build plate. If this is not done, the majority of the part will be "floating" 2mm off of the build plate. This is Section View, hiding the front and side of the assembly. The parts can be clearly seen in their respective positions, making assembly intuitive. The Bearing is on the peg on the Outer Shell, and the Inner Container goes around the Bearing. The Cap and Inner Plug can be seen at the top, holding the Inner Container in place. This is a Section View of the side of the Canteen. You can clearly see the position of all of the parts, including the bearings. This should help with assembly, giving a clearer idea of where the internal parts go.